This is the moment an alleged wanted killer pulled a gun on a cop when she went to investigate reports of a man loitering in a vehicle. 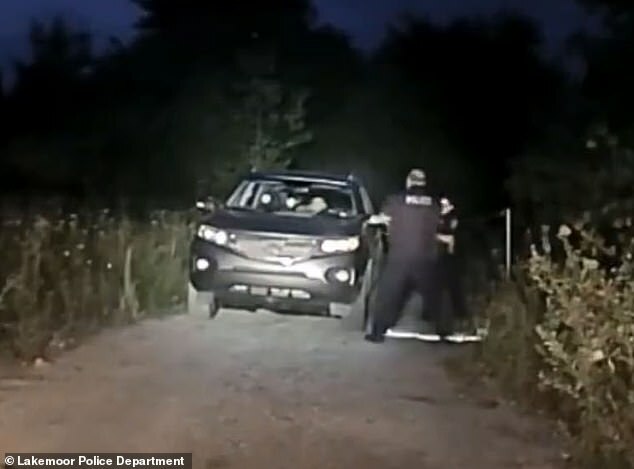 Kenneth Edwin Martell, 36, of Springboro, Pennsylvania, was shot dead by police after a prolonged struggle with a female officer in Lakemoor, Illinois, at about 5am on July 26, 2018. 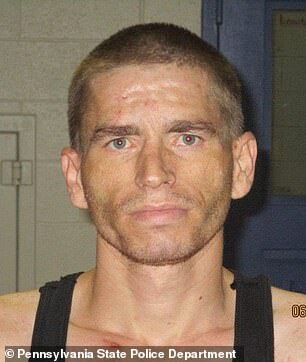 Pennsylvania State Police had issued a murder warrant for Martell on charges of first-degree felony homicide and multiple counts of terroristic threats and simple assault for the alleged stabbing death of an 88-year-old man during a home robbery in Pennsylvania on July 23. During that incident, Martell was said to have held a gun on three people, forcing them to dump the man’s body into a pond. Lakemoor police came across Martell while investigating a suspicious man in a vehicle early July 26. Authorities said that when Martell was asked for his ID, he pulled out a handgun and, in the ensuing struggle, that’s when an officer was forced to use deadly force. 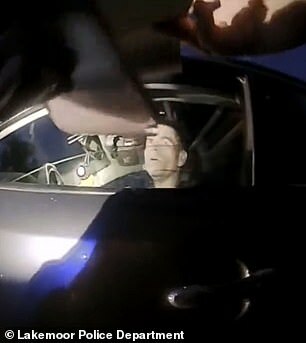 Body and dashboard camera footage captured the incident, revealing the dramatic moments that led to Martell’s death. 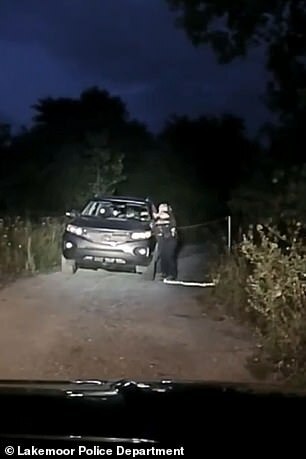 In the newly-released footage, a female officer can be seen standing by the driver’s side door of a dark-colored car and radioing in about the car’s license plate. A man — later identified as Martell — then hands the officer a piece of paper and then reaches out of view and draws a gun on her. Martell, meanwhile, can be heard saying, ‘If you stop…’ and ‘let go,’ as the officer says that she’ll leave, but refuses to release the gun. 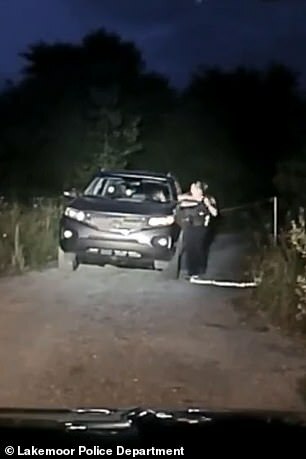 Despite the female officer’s high-pitched screaming, it appears that she is not panicking and it looks as though she continues to try to reach for the gun even though Martell has drawn it back inside the car. As this is happening, a backup officer can be seen running towards Martell’s car and stopping short a few feet away. He then draws his weapon and shoots Martell. Officials said after the shooting that the second officer ‘observed the offender was in possession of a second handgun’ and it was then that the officer fired at the Martell, according to a the Lake County News-Sun’s report at the time of the incident. Martell was declared dead at the scene. The Lake County State’s Attorney’s Office declared in December that the officer had ‘acted reasonably and appropriately’ when shooting Martell, according to the newspaper. 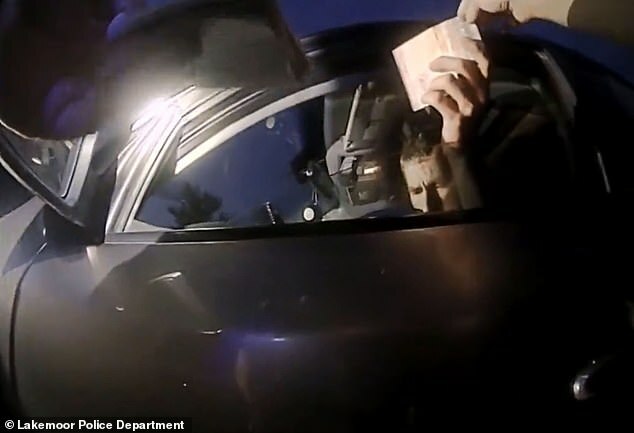 During the investigation, it was stated that Martell had given the female officer a fake name and that, after the struggle began and she had succeeded in pushing his gun back inside the car, the female officer saw Martell reach for a second gun that he had inside the car. When the female officer was finally able to step away from Martell’s car, the backup officer said that Martell raise revolvers in both hands and point them in the female officer’s direction, which is when the officer fired a round into Martell’s face. The attorney’s office declared that both the officers acted in self-defense.